Dhruv Verma is back home safely on 10th Oct 2017. Please don’t share this missing post anymore. More details at the verification section of this article. 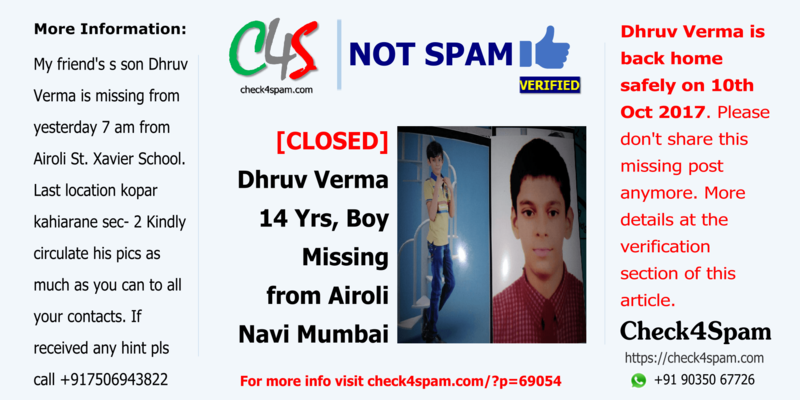 Dhruv Verma, 14 Years young boy who was missing from Airoli, Navi Mumbai is back home safely on 10th Oct 2017. Please don’t share this missing post anymore. 20th Oct 2017: Our volunteer contacted +917506943822 and was informed that the kid was back home on 10th Oct 2017.